Grain Free Blondies you guys!! I don’t know if you have noticed, but I am trying to branch out and create more recipes that are grain and gluten free. I have already done so with my Grain Free Blueberry Tart and my Healthy Key Lime Tart. Since the gluten free and grain free diets seem to be a trend nowadays, I thought you may enjoy this recipe. 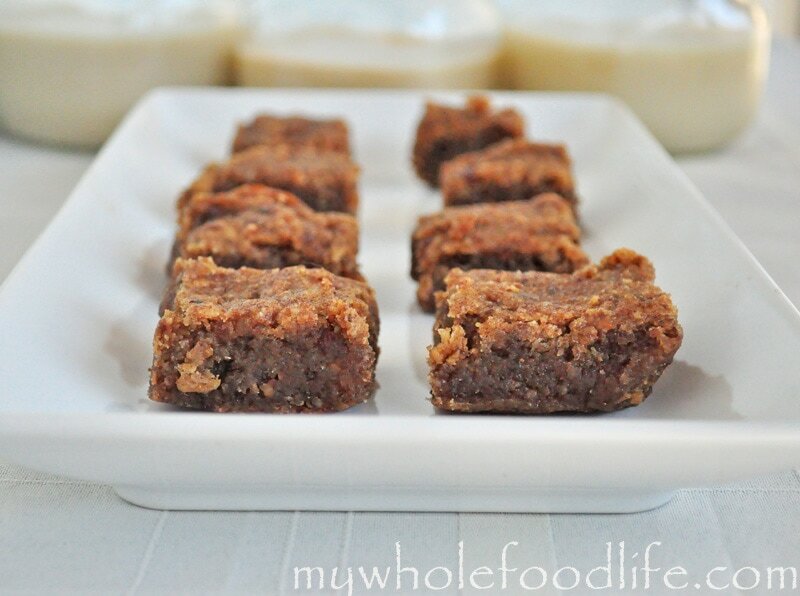 These grain free blondies may be the start of many more grain free desserts in the future. I under cooked mine slightly because I wanted to maintain a gooey and soft center. Another awesome thing about these blondies is that they are only sweetened with dates. I love dates! 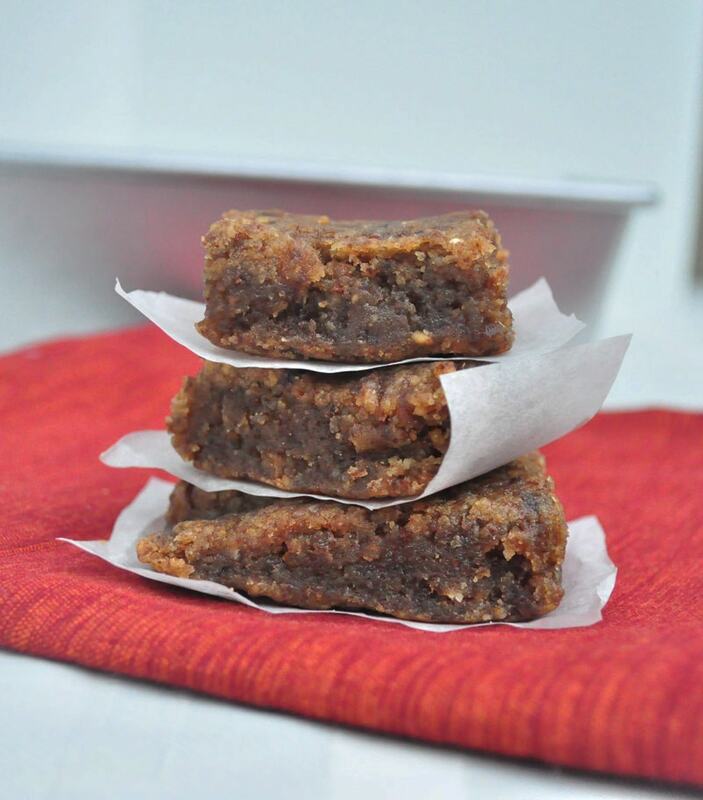 Soft and gooey blondies that are grain free! In a food processor , grind up the dates. Add the almond butter and coconut oil and pulse together. Transfer the mixture to a mixing bowl and add in the eggs, vanilla and milk. Lastly, add the dry ingredients and mix well. Cut a sheet of parchment paper and place it into an 8X8 baking dish . Make sure you have enough paper to stick out the sides so you can easily grab the whole thing out of the pan. Spread dough evenly inside the dish. The dough will be sticky and using wet hands or a wet spatula can make it easier. Let it cool completely before removing, and then cut the blondies into squares with a pizza cutter . I stored mine in the fridge. Enjoy! These look great!! I have never used flax eggs before. Can I just use two regular eggs in place of them? Thanks! Have just baked a batch of these and oh my goodness they are delicious! I didn't have almond butter so just used peanut butter and a pinch of Himalayan salt - yum! I also used real eggs. Approved by the hubby too! Thank you for such a fab recipe... Now to try and not eat the lot in one go! Yay!! So glad you enjoy them! I have never tried, but you might be able to? If you try, please let me know how they work out. You can use applesauce instead. Loved these!! I've been trying to find alternative desserts that use no processed sugar and grain free is a bonus! These were a total hit in my house! Oh yay!! Glad to hear that! Hi, after going grocery shopping, I realized I don't have enough dates (I have 5). Can I use what I already have or will the recipe not turn out? Are there other alternatives or should I double something to compensate? Thanks!